I work with a local organization, Salaam Cultural Museum, that sends volunteers to Greece to meet the boats of Syrian refugees landing on the island of Lesvos. These volunteers are the first contact the refugees have with people after being in the sea for days. SCM is run solely on volunteers/donations and also runs a hospital at a refugee camp in Jordan. I have been helping collect clothes and medical supplies for SCM for over a year now and recently received a donation bag of small stuffed animals. At first I was excited about this gift for the kids, then I realized that through the generosity of so many, the children also received hats and wonderful goodies. Wouldn’t it be nice for them to have something to carry all this stuff in? Something that might also be used as an extra pillow at night? Something that helps keep little hands busy tying and untying knots on long upcoming trips in cars and vans and buses and planes? Something that was bright and fun, colorful and warm? So I had the idea to make no sew pillows from the fleece that is on sale right now at Joann. I’m including a tutorial here in hopes others can join me in making them. If you are local, contact me for drop off of your completed donations. If you need a shipping address for mailing, check here. ensure you cut in a straight line. The great thing about fleece is that it is a synthetic fabric that doesn’t fray. 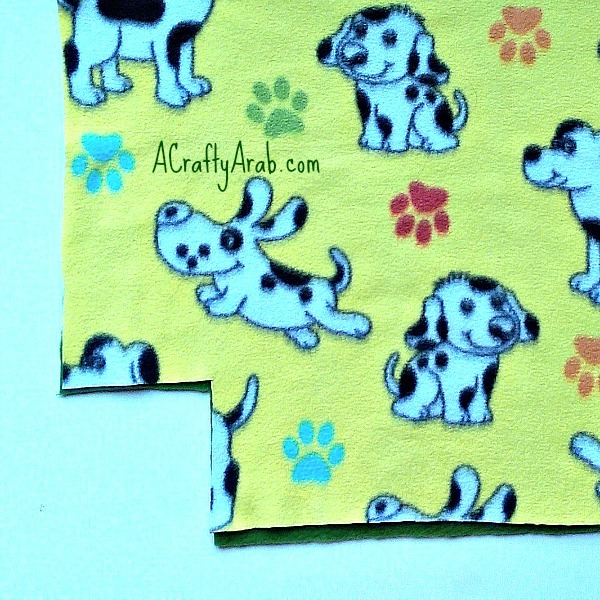 Most craft/fabric stores have fleece that comes in a variety of colors and patterns, and it’s a fun idea to do one piece that is patterned and one piece in a solid color. 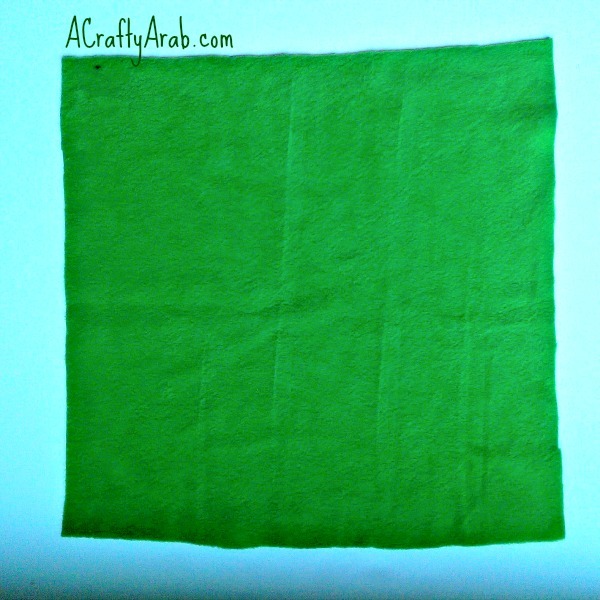 Cut out the small 4 inch square out of each corner of the fleece. 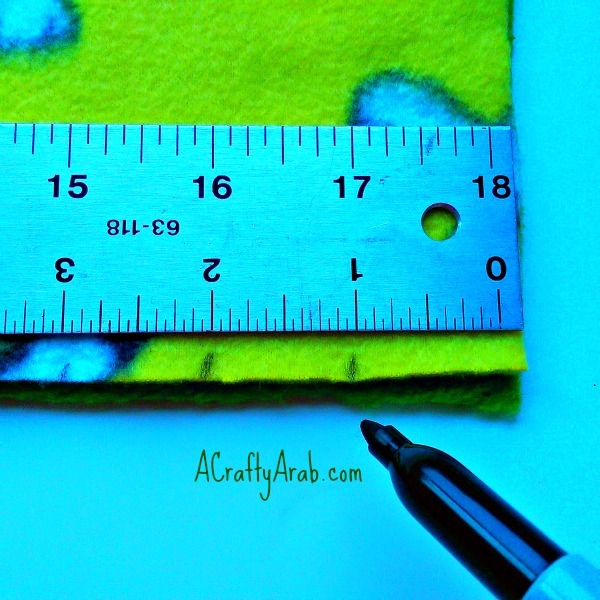 This will take out extra fabric and makes your pillow form tight. 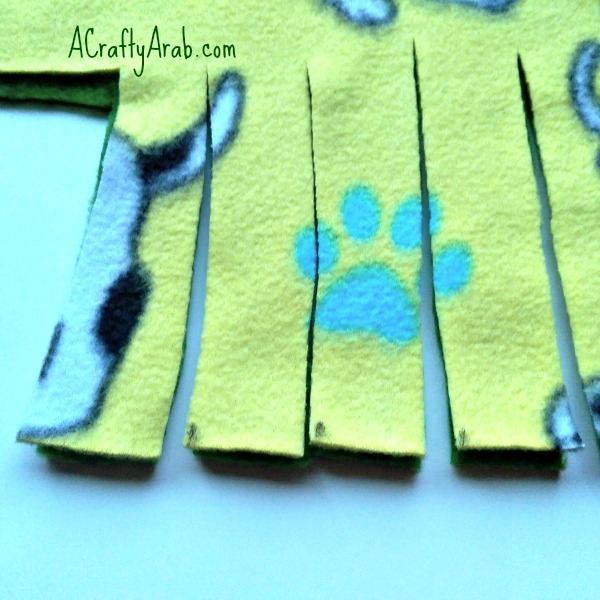 Lay the 2 pieces of fleece on top of each other, aligning them as closely as possible. 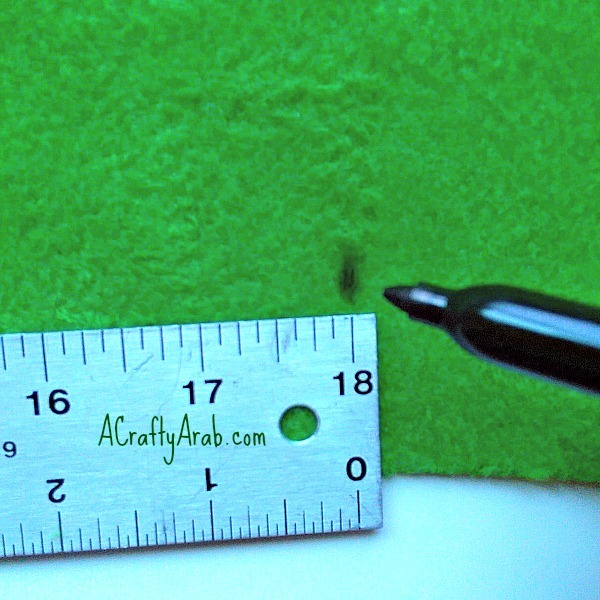 Start at 1 end and mark the fabric every inch (2.5 cm) starting from the end. 4. Cut the fabric to create the fringe. 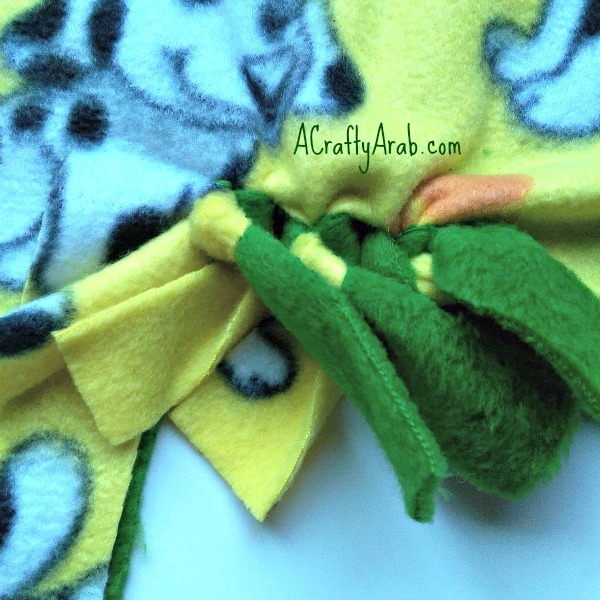 Start tying the fleece together by taking a piece of fringe from each side and double knot it together tightly. Continue to knot the sides together until you have completed 3 sides. When you arrive at the last side, leave it open so that children can add their items once they receive their no sew pillows. *If you would like to make an extra pillow for yourself, you can use fiberfill or a pillow form for the stuffing before you close the forth side. Crescent Moon and Star Traveling Tic-Tac-Toe or use an old Altoids tin, ribbon, buttons to make this Button TicTacToe game. 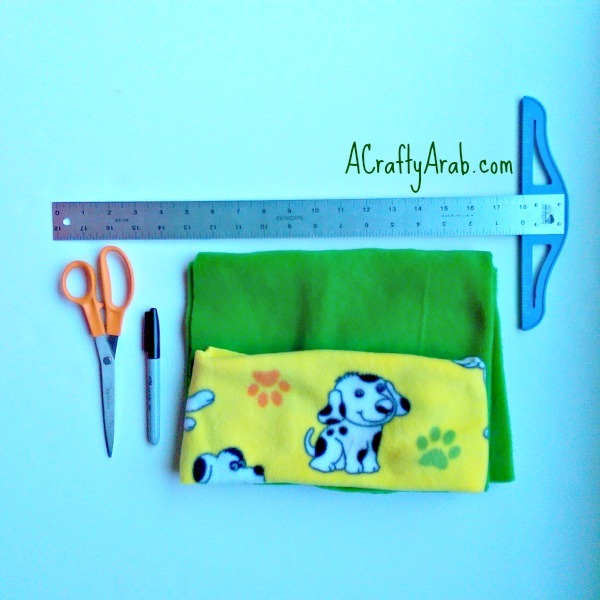 Check A Crafty Arab on Pinterst for more tutorials.